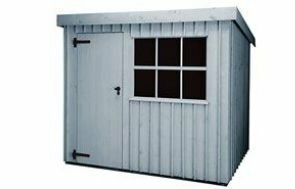 This 2.4 x 3.0m traditional-style National Trust Felbrigg Garden Shed is one of our wider range of garden sheds which all include delivery and installation by our dedicated, in-house team. The exterior vertically-sawn boards were painted in our Disraeli Green from our National Trust paint palette and combined with cast iron door furniture and black corrugated roofing. Our show centre located in Sunningdale, Surrey (located within Hillier's Garden Centre) has more than 25 different buildings on display for you to view. Our friendly team are on hand to help you with any queries. Why not plan a visit there this weekend? Alternatively, you can pay a visit to any of our other 7 show sites across the UK. Our Felbrigg shed was delivered yesterday and I just wanted to say how pleased we are with it. Roger and Jamie who erected it were extremely courteous and industrious. They made an excellent job of it and their attention to detail was a joy to watch. The timber we use to produce our garden buildings is FSC® certified Scots Pine and of the highest-quality to ensure our products reflect this also. 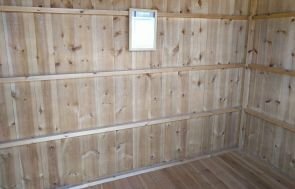 All our garden buildings are hand-made to the individual customers specifications, allowing us to offer completely bespoke buildings to meet specific requirements and needs. The building here is our shed from the National Trust range, which is inspired by the outbuildings on the National Trust estates in East Anglia. The range reflects the traditional styling of these outbuildings and is perfect for the more discerning customer. If you'd like to see more of our National Trust range, you can do so by clicking the link below.